Nina Totenberg has been covering the United States Supreme Court since Earl Warren’s last year as chief justice, in 1969. As you might imagine, a few things have changed since then. 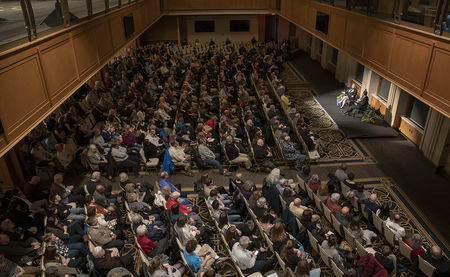 Start with the obvious, as NPR’s legal affairs correspondent did Thursday night, Feb. 7, before an audience of more than 500 people in Corbett Family Hall’s seventh-floor ballroom. Though it still hasn’t reached parity, journalism’s gender landscape is evening out. Totenberg is far from the only woman in the newsroom — and she no longer writes her stories while sitting next to rookie male reporters making 50 percent more money than she does. Over those five decades, Totenberg has reported on the nominations of three chief justices and 16 associate justices — and the unsuccessful nominations of several others — while becoming the nation’s foremost journalistic interpreter of the Supreme Court. Of the shifts she’s witnessed, those of greatest interest to her audience happened inside the court and in the law itself. Her candid conversation with Notre Dame law professor and constitutional scholar Randy Kozel, sponsored by the Law School, traced several. The Supreme Court’s caseload has been cut in half, down from about 160 cases per term in the early 1970s to more like 75 or 80 today. Diversity of experience is no longer a priority for nominations — where the Warren court featured former politicians of wide-ranging achievements, Totenberg said that all the current justices save Elena Kagan were plucked straight from the federal appeals courts. NPR legal affairs correspondent Nina Totenberg, left, speaks with Notre Dame Law Professor and Associate Dean Randy Kozel on Feb. 7 at the Downes Club Ballroom in Corbett Family Hall. Photos by Barbara Johnston/University of Notre Dame. It is no secret that the justices’ religious backgrounds have moved from mainline Protestant to mostly Jewish and Catholic. And, Totenberg said, given the success of the “Federalist Society revolution,” the failures of presidents Bill Clinton and Barack Obama to tackle judicial nominations early in their terms, and the replacements of the Republican-appointed centrists Sandra Day O’Connor and Anthony Kennedy with current justices Samuel Alito and Brett Kavanaugh, the court’s ideological makeup itself has grown decidedly more conservative. “It will result in a very different court for generations to come,” she noted. One far subtler change, the inclusion of a synopsis at the top of each court opinion, has made Totenberg’s job much easier — and her listeners’ understanding of newsworthy rulings more sophisticated, or at least more accurate. “We all made mistakes,” she said of those earlier days. Synopsis or no synopsis, she told Kozel, nothing substitutes for being present when an opinion is handed down. “Because we live in the digital age, somebody back at NPR is looking at the synopsis while I’m in the courtroom,” she explained, turning to the 2012 Obamacare ruling for an example. “Being in the courtroom saved me from making the mistake … that a significant number of my colleagues made,” she said. Namely, reporting that the court had struck down the Affordable Care Act’s individual mandate to purchase health insurance, when in fact the court upheld that provision. 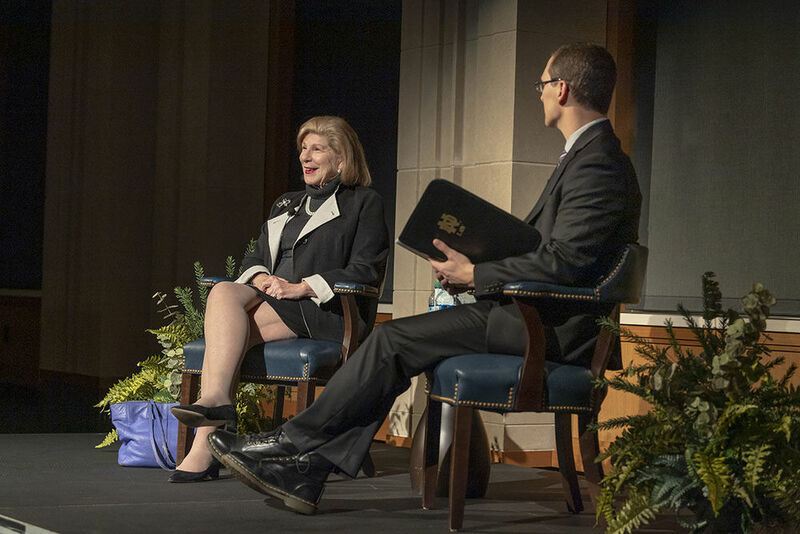 More than 500 people attended “A Conversation with NPR’s Nina Totenberg” on Feb. 7 at the Downes Club Ballroom in Corbett Family Hall. Notre Dame Law School sponsored the event. Asked to compare the four chief justices of her tenure, the 75-year-old Totenberg said that Warren and William Rehnquist, the latter of whom served from 1986 to 2005, were the most successful so far, and the most fair. Warren was “a politician in the best sense of the word,” she said, a man whose commitment to consensus and inclusion best explains to her the unanimity of his court’s landmark 1954 school desegregation ruling in Brown v. Board of Education. While Warren was often criticized for not being a constitutional “theoretician,” his essential dictum was, “But is it fair?” — a standard that matters more by far to ordinary people, Totenberg said, and which led to fundamental improvements in due process that we take for granted today. For his part, Rehnquist had “a wicked sense of humor,” Totenberg recalls. More importantly, he led the court with a Warren-like devotion to its traditions and culture, to fairness and mutual respect in its deliberations, a quality that produced a more unified vision along the bench, even in some higher-profile cases. Could she think of anyone who had the makings of an excellent chief justice but never got the chance? “Merrick Garland,” Totenberg replied to some applause. “He’s not all that liberal in a lot of ways,” she said of Obama’s 2016 nominee for associate justice, who never received a hearing in the Republican-led Senate. “The saddest thing about the failed Garland nomination is that, even if you love the nominations of Neil Gorsuch and Brett Kavanaugh, you can’t look back at that 10 months and say that it was fair. It wasn’t fair. It had never been done before. Not for that length of time. And it will be done again. The New York City native is one of three daughters of famed concert violinist Roman Totenberg, the story of whose stolen and posthumously recovered Stradivarius violin she told the audience with some emotion. She said she always knew she wanted to be a reporter. Writing for a Boston newspaper in her 20s she covered everything — the police beat, the courts, education policy, “whatever.” She learned her way around Capitol Hill as Roll Call’s only staffer, then added the nation’s highest court to her beat when she took a job at the weekly National Observer. She started by calling up each of the associate justices to ask if she could drop by to meet them. To her surprise, most of them gave her anywhere from 20 minutes to an hour, and she simply asked each one how he did his job. Their answers were an education in themselves. Joining NPR in 1975, Totenberg had already established her reputation as a reporter who got stories others couldn’t, but for years she still had to cover the Justice Department, the rest of the federal judiciary, both congressional judiciary committees and the intelligence community — terrain she said NPR now patrols through 10 full-time correspondents. “You were my first law professor,” third-year law student Jake Crammer told her during the question-and-answer period. Newsweek may have once called Nina Totenberg the “crème de la crème” of NPR News. But at Notre Dame Law School, “you were my first law professor” is an even higher compliment. John Nagy ’00 M.A. is managing editor of Notre Dame Magazine. Originally published by John Nagy at law.nd.edu on Feb. 8.